I have heard some shamans lately such as Christina Pratt and Malidoma Some speaking of the epidemic of dead, especially in the United States. That more than ever before, the world is inundated with dead who have not been able to get to the ancestral realms and return as true ancestors due to poor health in life, lack of any cosmology, many unresolved issues due to a life lived without awareness of one's purpose, family members that refuse to let go, a lack of flowing of grief/tears and a lack of proper funerary rites that pay attention to the deceased's soul rather than just the living. This manifests in many ways, not least of which is young people stricken with diseases that typically only afflict the elderly and many people stuck living out the unresolved issues of their ancestors instead of their True Will/Great Work so to speak. I was curious about your thoughts on this matter, particularly in the context of Palo Mayombe and the work of a Palero. I think this is not only a good question – but an important one. I believe that for Western men and women the word ‘dysfunction’ is a label most of us can use to describe our family relationships. This is really a sad condition. The art of psychoanalysis was developed because of this dysfunction and its sexual reflex, so certainly we are here speaking of a sickness that contaminate our blood and memory – and by extension our sense of Self. Malidoma Somé told in an interview with Michael Bertrand the following: “I've discovered over the years that people prefer to look forward because when they look back they find the memory they have of their ancestors is not that good. Those who can remember are connecting with crime, violence and pain.” Still, as a Yoruba proverb says: “we stand on the shoulders of those that came before us”. We look forward, because the pain of the past is too much to carry. There is something wrong in this; the past should be our foundation and Death our memory. 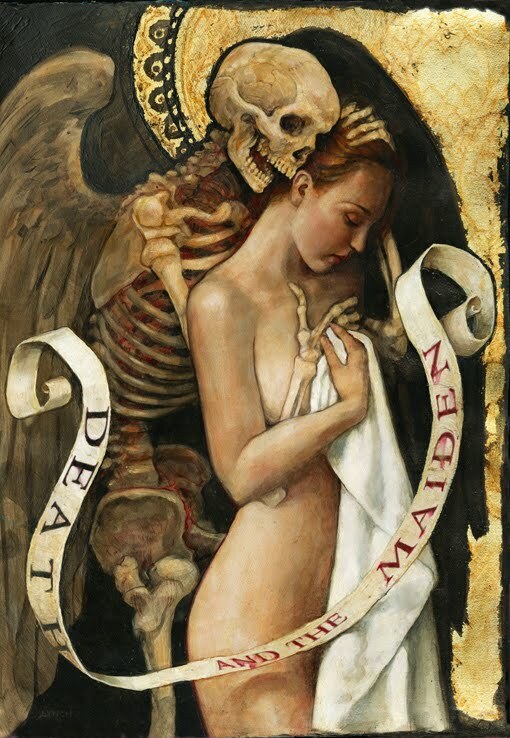 Death tells our story and the fact that Modern man refuses to look at Death and past also reveals a denial of Self. Traditional societies are all erected on bones of ancestors. As we walk this earth we walk what was once men and women, beast and plant – the earth is a graveyard and in the graveyard memory flares and flashes in the constant call for return. This return is about source and reconnecting with the beginning – and our family carry the memory necessary for this return. If we forget the past we tend to repeat it and if we look back in interest we will gain knowledge of who we are and how we got to be this way. A spiritual family, like a nzo of Palo, can mend this – but it can also be an escape from dealing with one’s own bones and memory. If one’s search for a spiritual family is about an escape from one’s own bones one is likely to contribute with dysfunction. Family is about challenges and blessings. If we understand the challenges, blessings will shower over us. If we turn away from the challenges we are prone to generate ghost roads of disillusion and wishful thinking. It is a bout acceptance – and with acceptance – we leave ourselves with no other choice than understanding the challenge and move on. To move on, to look to the future is a good thing – but if our move onwards is accomplished by setting fire to the bones that gave us life we are doomed. We doom ourselves to live a life of senseless ambition lacking pole and north. In Palo Mayombe we reconnect with source to a certain extent – we reconnect with a legacy and memory of our choosing – and this comes with a different commitment. But if the memory concerning the bones of your own blood is not resolved, understood and accepted the resistance of solution will be imposed on the spiritual family. In this you will impose a dysfunction upon your spiritual family, issues that should have been solved prior to making blood bonds with a spiritual and ideal family and its ancestors. So, I believe that when Western man seeks initiation – especially in African or Afro derived traditions – a wish for connection and acceptance is at play, but as the past is a matter too infected with pain and resistance for many, they choose to recreate themselves without sorting out their foundation. Moving on in the world without a foundation is a sure recipe to failure and no matter what we do we will end up in the same challenge as mirrored from a thousand angels in conformity with our choices. Whatever we don’t solve at a given point in time, if it is important, it will resurface in new masks and drapes again and again. There is no way outside this unless we embrace sickness, depression and emptiness. Our ancestors are a part of us; they live on in our DNA and bones, our blood and constructs of mind and soul. We are all dead, just not yet buried! There is another Yoruba proverb telling that, “if you don’t know where you are going, any road will do”. The map of our compass is the bones of our ancestors and the compass is the full acceptance of who we are and with the recognition of where we are coming from. In this we also find the comment from The Saga of the Vikings of Jomsburg where King Svein Forkbeard is forced to move the funeral banquette of his father several times. At the fourth time of postponing matters are getting critical because the King is starting to look suspicious and ‘un-kingly’ in his negligence, because a man is not dead until its heirs have followed their customs. Lacking this transition of customs the dead ones will be restless and they can infect the living in negative ways. If we don’t accept our ancestors we are not accepting our selves, and instead of resolving issues of blood and bones we end up making fragile constructs of avoidance. It is not a good thing and it is a source of instability and by consequence disease; disease of the mind, of the soul and of the body. Ultimately we infect the earth itself with our resistance and as memory calls us back to our senses we insist n making more bad choices and remove ourselves from who we really are. So, yes, everything is connected and Death holds all the keys. Death should be our companion, not our enemy – because Death is not End – it is transition. Death is the Mothers calling you back, calling your attention, calling you to find yourself in the darkest resistance of the pitch black night of the soul. Turning your back to this is surely to open a gate for putrefaction to enter the world. Your resistance towards your very own bones is the key to Hell. We rest on the shoulders of those that came before us, we walk the scales of the Dragon and Her scales are shaped and formed by bones, blood and memory. So I say, look back in a spirit of acceptance, if it is your father or mother, your brother or sister you will always see a mirror of challenges and blessings – you will see the blueprint of your soul and the map of your world. The compass is forged by Fate, but unless you know the boney landscape, how would you know what road to take?